Fun graphics & colors say, "Whee!," but sturdy construction says, "I'm here to work." There are needs, and then there are wants. You need reliable. Useful. Thoughtful. You want exciting. Colorful. Fun. Grown-ups know you can't have both. Luckily, artist/designer Tim Eads is not that kind of grown-up. 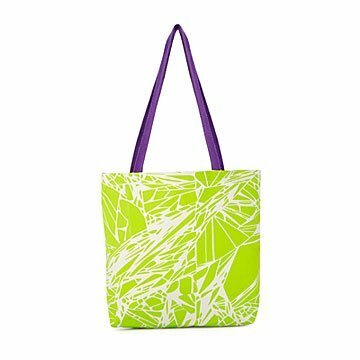 This tote's vivid colors and energetic graphics make a direct hit to the brain's fun sector. But it's also a handy, heavyweight cotton canvas workhorse for carrying daily essentials. Tim Eads was born in Denver City, Texas and currently lives in Philadelphia. Eads is a Master Printer with 20 years’ experience. He was a Master Printer and Project Manager at The Fabric Workshop and Museum from 2009- 2015. He started screen printing in 1997 in his studio to finance a degree in graphic design. Since then he has worked as a graphic designer, art instructor, master printer, and artist filing the world with color and pattern. Tim Eads makes apparel and accessories for modern life that are expressive, stylish, usable, and comfortable. His mission is to add bold, graphic designs to your world. Eads creates each pattern on the computer and develops every product in his line through a series of iterations and adjustments until it is perfect. Eads, along with assistants, screen print every yard of fabric by hand and sew all the bags in house. Only the best materials are used so the finished product will stand up to life’s demands. Eads’ apparel line follows the same design process and is made by independent sewists in the Philadelphia area. All products are sustainably and ethically made in a low-waste facility utilizing every scrap of fabric and ounce of ink. Machine wash cold, tumble dry. Spot clean as necessary.